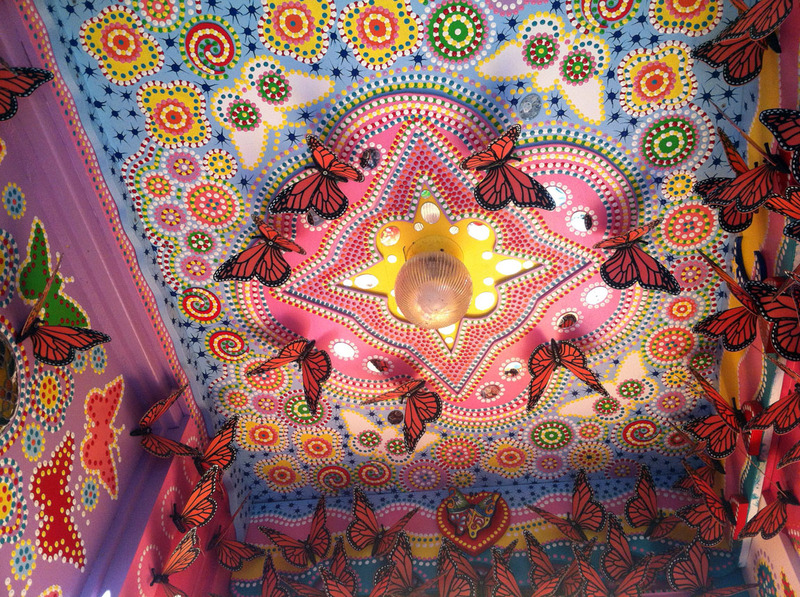 Bright colors, extravagant beauty and butterflies; butterflies of all shapes and sizes. 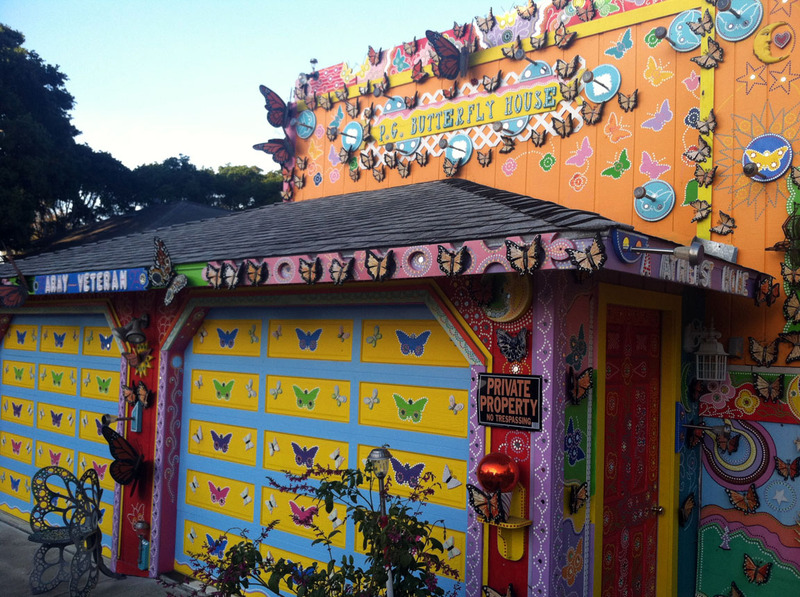 Located at 309 9th street in Pacific Grove this magnificently colored house is hard to miss. It is a wonder to all ages young and old with the flow of its brightly colored butterflies from the widely known Monarchs down to the smaller Cracker butterflies. Ironically, Pacific Grove is known for being the “Butterfly Capital of California” so it is not that uncommon to spot many of these glamorous insects as one strolls the street. The colors and patterns that make this Pacific Grove house extraordinary all come from the brilliant creativity of J Jackson. The owner, J Jackson, sculpted this master piece after he found out that his loving wife Sonia was diagnosed with the eye disease Retinitis Pigmentosa. He was later informed that this disease would leave Sonia unable to see anything but very bright colors. So, being her loving husband, J picked up his brush and let out the artist within. 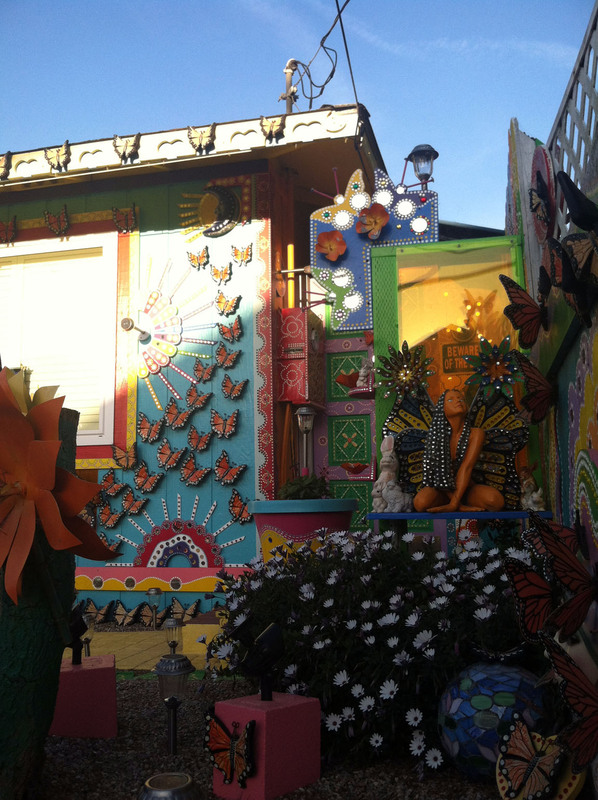 Their house has become a must see while visiting Pacific Grove. Attached on and around the house lies more than one thousand butterflies, that appears to delicately flutter on the outside of their home. This place is perfect for creating childhood memories that last a lifetime. Every color you could imagine fills the outside of their house; from bright oranges and yellows, to the vast purples and reds that are surely bound to follow you on this breath taking adventure. Pictures are welcome here at this colorful Pacific Grove home and it would be a shame not to bring your camera. Aside from the Monterey Bay Aquarium, this little house is a definite must for the whole family to enjoy. Especially on a warm sunny day, these magnificent butterflies always seem to bring out the beauty in what nature has to offer. Living in Pacific Grove for more than four years, I have seen much of this little city’s wonders. While nothing surprises me much anymore, this little house on 9th street always seems to brighten my day on any bad occasion. But don’t take it from me, see for yourself. Written by Pacific Grove High School student, Noa Umbaugh for MPHTBlog.com. Search all Pacific Grove real estate. So happy to learn about this. It will definitely be at 'must see' on my next trip to Pacific Grove. !